If was any doubt that Sarah Palin’s warning about the death cult the democrat party has become since the ultra-radical progressive movement wrested control of the party from it’s more reasonable members, the above quotes should end that debate for all time. Those words come from democrat Congressman Bart Stupak. Congressman Stupak is one of just a handful of principled democrats left in government, and a real hero. Stupak, of course, is talking about abortion funding here. 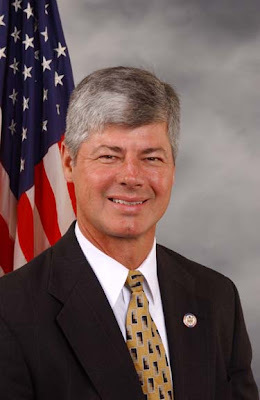 You see, like most Americans, Congressman Stupak believes in the sanctity of life. He is leading a small group of like minded democrats who oppose tax payer funded abortion. When Sarah Palin wrote her famous blog post pointing out the reality that her beautiful son, because of his disability, and her parents, because of their age, would not fare well when they went before ObamaCare’s “death panels” she was dead on. Of course, the radical progressives lost their minds, and tried to discredit Sarah with all kinds of caterwauling and slight of hand, but at the end of the day, all Americans will face ObamaCare’s “death panels” each and every time they need health care. First of all, yes, there will be “death panels” and no, they won’t be called that. As we have talked about, ad nauseam, there will be “comparative medicine boards” where a group of faceless, nameless bureaucrats will decide who gets care and who doesn’t. This won’t be based on what will be best for the patient, these people won’t be weighing on the best medical practices for an individual. The ramifications from this twisted thinking are enormous. Even worse, we all know that it is all but impossible to fire a government worker, once they are entrenched, and there will be almost no way to meaningfully appeal one of the poor decisions made by these government drones. The bottom line is this: Once ObamaCare becomes law, the only thing that will matter to the government is shaving costs. Let’s face it, the government, because of entitlements already promised, is broke. Adding a couple of trillion dollars more, just to start, isn’t going to help matters a whole lot. How will the government save money? By only treating the “productive” members of society, of course! Rahm Emanuel’s brother, Dr Ezekiel Emanuel, Obama’s health care advisor, literally wrote the book that sets up, not only the “death panels” but the guidelines for who should be allowed to live, and who can be left to die. 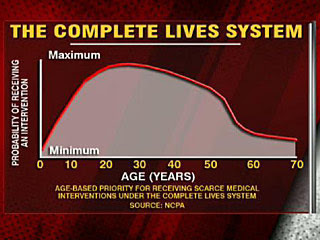 Emanuel, vying for the title of “America’s Josef Mengele” wrote about the “complete lives system.” This lays out the argument that only the most productive deserve the best health care. Every American should read this. It comes from a truly diseased mind, and represents the progressive movement that controls the democrat party completely. Read it all here. As you see, once you get past 30 years of age, the government won’t think very much of your ability to be productive. How insane is that? What is so glaring to me though, is just how vile and cold these progressive democrats are. Of course, progressives have pushed the mass murder of babies since the turn of the last century. Ever since Margaret Sanger worked to make abortion acceptable, to “cleanse” the earth of blacks and other “human weeds” (her words) progressives have been on board. Sanger’s Planned Parenthood is the holy church of the progressive movement. The right to murder babies is one thing this bunch will actually go to war over. Even so, for the death cult to openly admit they want massive tax payer funded abortions, and less babies…LESS AMERICANS… to save money for this unconstitutional ObamaCare boondoggle is simply breathtaking. Quite simply, fewer babies means fewer people ObamaCare will have to cover. There is something inherently evil in this sort of thinking. The sanctity of life, the protection of the innocent, is what sets us apart from the lower species. It should alarm all people, worldwide, that this President and his Congress not only want to promote the destruction of human life, in a crass attempt to save money for a health care overhaul that the American people don’t even want, but want the American people to pay for it too! It’s also one more reason that ObamaCare must be defeated and the progressives run completely out of government for all time.